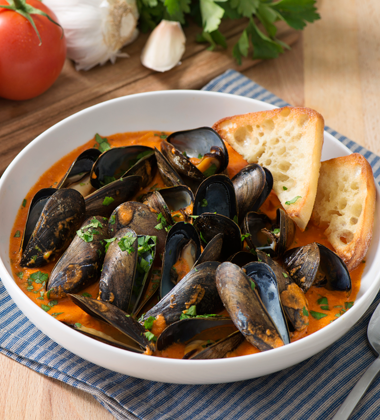 Roasted Red Pepper Bisque with Gouda makes a rich, flavourful broth for the mussels. Use the ciabatta buns to sop it up. 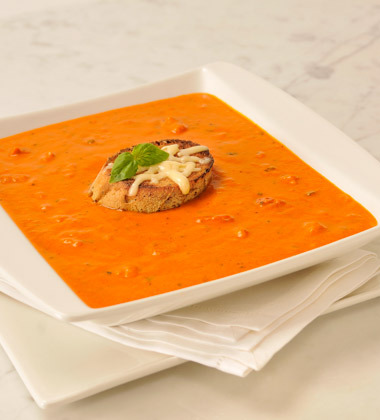 A rich and smokey tomato bisque accented with Gouda cheese, fresh cream, pureed roasted red bell peppers, crushed garlic and sweet basil leaves. 1. Heat 1 tsp (5 mL) oil in skillet set over medium heat; cook 2 tbsp (30 mL) onion, 1 1/2 tsp (8 mL) garlic, and pinch each of salt and pepper for about 2 minutes or until slightly softened. Pour in 1/3 cup (75 mL) dry white wine; bring to boil. Boil for 2 minutes. 2. Stir in 1/3 cup (80 mL/) soup and 1/4 cup (60 mL) water; bring to simmer. Tap any open mussels, discarding any that do not close. Add 1/2 lb (113 g) mussels. Reduce heat to medium-low; cover and let mussels steam for about 5 minutes or until mussels open, discarding any mussels that do not open. 3. Meanwhile, toast 1 ciabatta bun under broiler or salamander for 1 minute. Brush with 1/2 tsp (3 mL) olive oil. Transfer mussels to serving dish. Sprinkle with 1 tbsp (15 mL) parsley. Serve with 1 ciabatta bun.